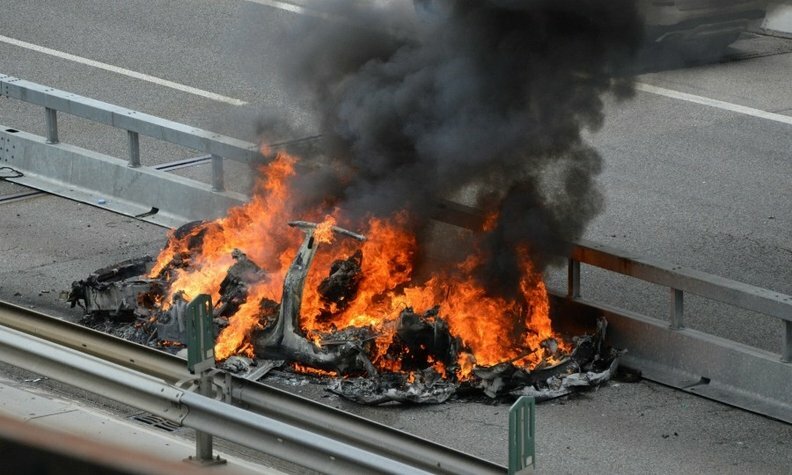 A Tesla burns after a crash in Switzerland which killed the 48-year-old German driver. ZURICH -- Swiss prosecutors have begun looking into the circumstances of a fatal crash of a Tesla electric car last week that firefighters think may have set off a fire in the vehicle's battery. A 48-year-German driver died when his car hit a highway barrier in the southern canton of Ticino, rolled over and burst into flames. A spokesman for Ticino prosecutors said authorities were examining what led to the accident. It was too early to discuss the cause at this stage, he added. "So far, the only thing for sure is that there was an accident with a Tesla," he said, declining to say when results of the investigation were expected. Tesla said it was also looking into the incident. "We are deeply saddened by this accident and we are working to establish the facts of the incident and offer our full cooperation to local authorities," a company spokesman said. "Tesla has not yet received any data from the car and thus does not know the facts of what occurred, although it appeared to be a high-speed collision." The crash last Thursday was one of several accidents to affect Tesla vehicles in recent days. On Friday a Tesla Model S crashed at speed into a truck in the U.S. state of Utah. The U.S. National Highway Traffic Safety Administration (NHTSA) is also reviewing a Florida crash of a Tesla vehicle last week, resulting in the death of two teenagers.